Hmm. In addition to being so hubris-filled that I thought I was beyond doing yarn math, I also seem to be unable to post to Craftster – I posted the below earlier today and it doesn’t seem to have gone through. So here it is again, and if this is somehow a repeat, my apologies – just wanted to be sure that at least I could be a cautionary tale…. Thanks for the helpful replies to my questions; I went ahead and did 10 inches of mock rib and finished with 5 inches of double rib...and it's just a too short. The only way to get it to wrap in a nice way around my body requires pulling the back collar area halfway down my back which makes the vest nearly off-the-shoulder, which is not a very good look for this vest and possibly all vests since they are pretty much by definition held up by the shoulders. I am 5'8" so perhaps if you are shorter you can get away with less mock rib. Otherwise, anyone out there who is running low on yarn and thinking that maybe a bit less of the mock rib will be enough, beware. I am going to spend a day in mourning and then I'm going to rip the whole thing apart and, after doing very careful yarn math, if I have enough yarn, I'm planning on knitting up the anthropologie caplet that was kindly suggested by one of you. We must remember that it is the agonizing defeats that make the triumphs so triumphant. Even if the defeats are more because we are dumb rather than visionary or strong or brilliant. Sorry to hear that yours turned out shorter than you like. I'm 5'7" and i knitted mine for a total of 30 inches - 5 inches double rib each at the beginning and end, and then i knittied 20 inches of 1x1 rib for the body. Did you remember the extra 4 inches when you casted on? That gave mine the cap sleeve effect. if you did, then i'd suggest frogging the last 5 inches of double rib you knitted - add 10 inches (or a little more) of your mock rib for the body - then finish off with the 5 inches double rib. This way you don't have to frog the whole thing. even't though i'm 5'7", i have to tell you that i do have a bit of a long torso. so 30 inches in length might work out for you. you can see pics on the previous page of this thread, on my blog, or my gallery. ok...so I've read through this entire thread at least twice. But forgive me if this has already been answered. 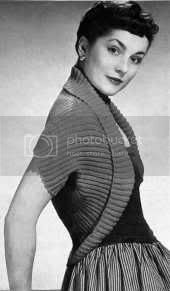 My question is....has anyone actually made this shrug from the yesterknits pattern? For myself I think the way the shawl collar lays on this one would be more flattering than having the ribbing stretched and pinned across my more than ample boobies I guess I'm looking for feedback on the pattern. I like the way it folds over completely and just lays that way. I requested the pattern this morning and LOVE all the FO's on this thread. Some one on this post made it. page 36, gleek knit it. I used purple worsted weight yarn out of a bargin bin at lewiscraft (100% unknown fibres, but was actually pretty soft! ), which is sold in lbs,(1lb for $7.00) not yards, so I have no idea how many yds it took... but it only cost me $4.66 to make!